Gunnedah Golf Club is a friendly & somewhat relaxed club that understands that dress sense,fashion and standards vary according to each and every individual. Members and visitors are required to maintain a dress code considered to be in keeping in both style and neatness with the character and standing of the club. Neat and tidy attire is required at all times. Arrive at least 20 minutes prior to check in. Have no more than 4 in a group unless previously discussed and approved. Be prepared to have others join you if you have less than 4. Be ready to play when it is your tee off time. Honor System V Ready Golf...The honor system states that the lowest scoring golfer from the previous hole shall tee off first or the lowest handicap off the first tee. Time can be saved where that player is not ready to tee off, Ready Golf should then be adopted. Mark your ball clearly so that you can identify it. Tee off ONLY when golfers ahead are out of range. Stand still & silent while other golfers are teeing off. Watch where the ball lands to avoid time spent looking for lost balls. Yell "FORE" if your ball is heading towards another player. Walk directly to your ball unless you reach someone elses ball first. Keep pace with the group in front of you. Assist playing partners by bringing clubs, finding lost balls etc. Follow all posted cart rules. Place your bag or cart between the green and next tee box. Select all the clubs you think you may need. Avoid stepping on another players putting line. - Remove any loose turf from the affected area. - Knock in all of the edge of the divot with your club or shoe. - Lightly sand area (be careful not to use to much sand). - Always start at the back of the mark and push forward with the Pitch Repairer. 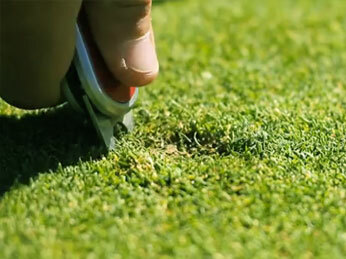 - Use repairer around all sides and slowly ease turf towards the centre of the mark. - **DO NOT Lift the soil upwards. - Lightly tap down with putter. - Your completed repair should look like this. Players should ensure when putting down bags or the flagstick that no damage is done to to the Putting Green. Neither they nor their caddies should damage the hole by standing in it when handling the flagstick or removing the ball from the hole. The flagstick should be properly replaced in the hole before leaving the putting green. 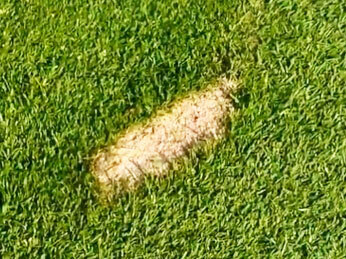 - Do not drop the flag on the putting surface as it can cause damage. - Always lower the flagstick by using a club or by hand. 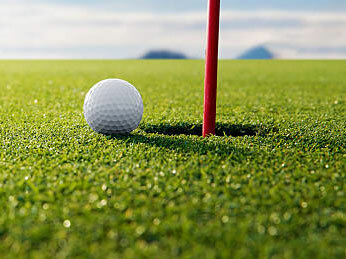 - Players must NOT use their putters to remove their golf ball from the hole. Before leaving a bunker, players should smooth over all holes or footprints made by them and leave the rake with the handle pointing toward the hole being played. - Always enter the bunker at the lowest point. - Pull the rake towards you as you exit the bunker. - If required rake other affected areas. 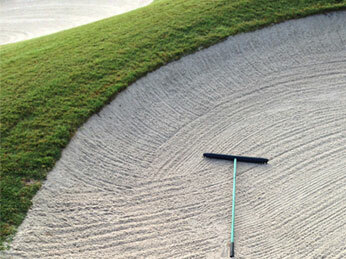 - Do not pile sand on the edge of the bunker,push back excess sand with reverse side of rake.